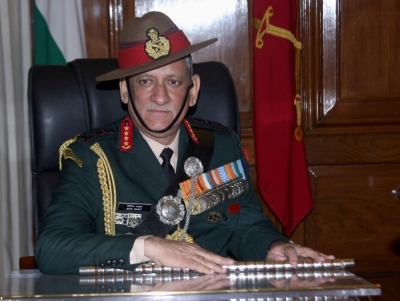 New Delhi, Aug 22 (IANS) Indian Army chief, Gen. Bipin Rawat on Tuesday reviewed the security in Jammu and Kashmir’s Ladakh, days after a skirmish took place between Indian and Chinese troops in the area, defence sources said. Rawat met troops, visited a few forward areas, and was satisfied with the security situation. The Army chief, who reached Ladakh on Sunday and on Monday attended an event where five battalions of Ladakh Scouts were awarded President’s Colours award by President Ram Nath Kovind, came back to Delhi on Tuesday afternoon after reviewing the security. A scuffle took place between Indian and Chinese soldiers on August 15, when Chinese soldiers tried to cross the Line of Actual Control (LAC). The skirmish was first of its kind, where soldiers resorted to stone pelting and fist-cuffing, resulting in injury to troops on both sides. A Border Personnel Meeting that took place on August 16, which saw both sides agreeing for taking steps to ensure peace along the border and leave the incidents behind, according to sources. Meanwhile, a standoff with China in the Sikkim sector has been continuing since June 16.